Live albums are back in fashion. For a long time they had been a relic of the past, but lately it seems like everybody and their brother has been putting out live records. Never more than this past year have I had so many live albums come to me for review. As a matter of fact – before 2016 I can’t recall getting promo material for more than five true live albums . Now I find myself with a handful every month. So why is it that apparently every band, big or small has been taking advantage of their live excellence lately in order to put out live records? Well when you start to pick the whole thing apart you realize that the reasons for having a live album almost outweigh the reasons to go and put out a studio record. The industry is changing, and the newfound dominance of the live album might be a key factor in the twenty first century. Whether this is for better or for worse is really up to you and the bands, more than anyone else. First and foremost – I think it’s important to remember that there is a certain romance to the live album. A lot of fans live in places that the band can’t afford to go, or simply refuses to go. Giving them a live album is going to satisfy a section of your potential market for whom the live experience was otherwise just a fantasy. Furthermore – if your live show is really that good then you are also going to sell some to people stoked after seeing you at shows, as well as people who think back to your shows and want to relive that experience. The same goes for live DVDs, or even better, the combination live album and live DVD, but more on that later. It’s a bit of a gamble given that you really need to evaluate before diving into, but it’s also one that requires relatively little money to dive into. This is where we start to see how exciting things can get in the triumphant world of live albums. The beauty of the live album is that these days they require virtually nothing to record nowadays. All you need is a friendly sound engineer and a top notch Tascam recorder which, odds are, your friendly sound engineer will already own. The mixing should probably be there, but in all honesty, if you have a good sound guy, it will already be done – and for free. As a matter of act, if you are at the level that you should consider making a live album then you should even be able to handle one of your main costs – printing the actual CDs and vinyl – with the money from the guarantee, meaning that now you only have to worry about the expenses from PR. In other words – you’re almost printing money. This is perhaps one of the most profitable type of releases that you could ever put together. Of course – not everyone can pull it off. So how do you know that your band is ready to pull off a live record? Well first of all you need people out there who rave about our live performances and who make a point of seeing you live. You need to be on a level that you can our regularly and get regular positive live press. You need to be a band who have a reputation for leaving it all out on the floor – but if you want to be successful well you kind of need that anyway. Note though that this does not mean that you necessarily need to be a big band. Some bands just do a lot better in a live setting. Some bands, if they don’t do things live would actually have more issues. For example the first time that I truly understood Mothership was when they put out their live record, Live Over Freak Valley using the exact same Tascam method I previously discussed. Think about what appeals to you the most about your favorite live records. It’s probably the raw energy and the crowd noise. The fact that it captures a moment in time that will never be had again, a moment that you maybe got to be a part of. The record that really got me into heavy music was Iron Maiden’s brilliant live release Rock In Rio and to this day it gives me goosebumps. Find the live albums that speak to you and use them as a barometer for what you want to do with your own live effort. Live albums are a potent medium and one that I think they are finally getting their rightful place in rock and roll. We always talk about ways to save money in the studio though and how there is no money in recorded music – but it seems that we weren’t totally correct. As a matter of fact there is money in recorded music, but as apparently with everything else in the music industry these days we need to go back to an older model that reminds us why live music is and always has been the basis of ALL music in the world. There is no escaping it – so why not record it? 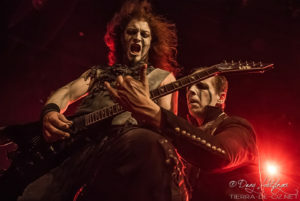 I write this while listening to Powerwolf’s excellent new live record, The Metal Mass – Live and it takes me back to the first time I saw them standing side stage at Hellfest. Powerfwolf are heavy metal titans, and they understand that they are best in the live setting so I’m actually a little shocked it took them so long to out together a live record. As is, this album is fun and exciting and it represents l that a live album should be. You need to take it, and albums like it as an example because it will save you money and stress. It will remind you of the power that this music holds and help to drive this whole fucked up band thing forward because live albums might very well be the future.